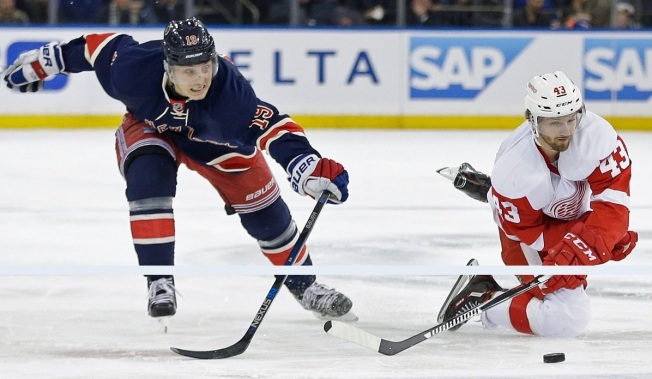 Kevin Hayes scored with 5:38 remaining, Antti Raanta made 31 saves and the New York Rangers defeated the Detroit Red Wings 3-2 on Saturday. Despite the loss, the Red Wings reached the playoffs for a 25th consecutive season when the Ottawa Senators beat the Boston Bruins. Detroit clinched third place in the Atlantic Division and will play the Tampa Bay Lightning in the first round. Hayes tipped Dylan McIlrath's shot past Jimmy Howard for his 14th goal of the season to make it 2-1. Oscar Lindberg added an empty-net goal to make it 3-1. Detroit's Justin Abdelkader scored with 1:34 remaining to cut the deficit to 3-2, but New York was able to kill off two late penalties and hang on for the win. Riley Sheahan scored in the second period for the Red Wings and Howard made 17 saves. Dan Boyle scored in the first period for the Rangers, who finished the regular season with 101 points. Raanta got the start in goal for the Rangers in place of Henrik Lundqvist. Ever Wanted To Spend $38K on a Kobe Bryant Cap? The Rangers still don't know their opponent in the Stanley Cup playoffs, which start Wednesday. With the win Saturday, the Rangers have a chance to pass the Islanders and regain third place in the Metropolitan Division, and would play the Pittsburgh Penguins. If they remain the first wild card in the Eastern Conference, the Rangers would play the Florida Panthers. Either series would start on the road.